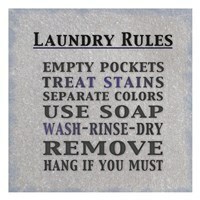 The laundry room or area is a very important place in a home. 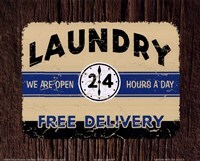 For dry cleaning companies, hostels, or hotels, laundry rooms are equally important. 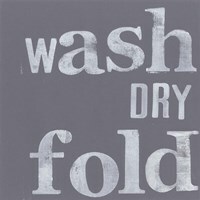 As a result, and in a bid to make it safer and easier to identify for residents, there are several country laundry art prints that can be used. 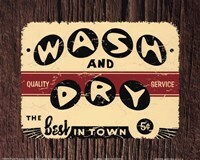 These country laundry signs have different messages, some of which give directions on what to do while others simply act as signs to show where laundry ought to be done. 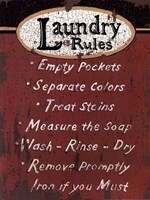 For example, "Laundry Rules" by Linda Spivey details some of the rules that one needs to observe when doing laundry. 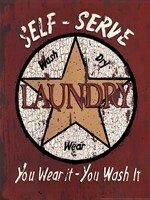 You can use a country laundry wall art at the entrance of the laundry area to show users where they can drop their laundry or clean them. 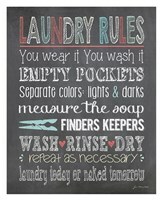 Some of the ones that you can use for this are "Laundry Room" by Linda Spivey, "Self Serve Laundry" by Linda Spivey, "Drop Your Drawers Here" by Mary Ann June, and "Laundry Room" by Linda Spivey. 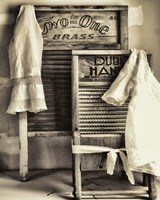 You can also have your choice artwork framed, laminated, or printed on canvas. 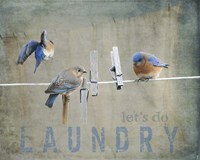 When choosing country laundry room art, a few things have to be put into consideration. These include whether it’s a business or a home. This is so because the signs that are printed on these wall arts are different and carry varying information. 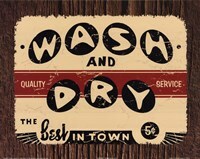 Examples of the country laundry signs art print that you can use for your business are "Same Day Service" by Grace Pullen, "Wash and Dry" by Paulo Viveiros, "Laundry" by Pat Fischer, "Laundry" by Paulo Viveiros, and “E-Z Laundry" by Mary Ann June. 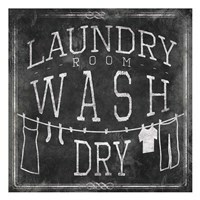 Other things to consider are the backdrop that you have for your choice country laundry art, the size of the space where you would like to mount it, the level of protection that you need for the artwork, and the color of the artwork itself. For example, you can use "Same Day Service" by Grace Pullen on a white or lighter blue background and achieve an amazing effect. 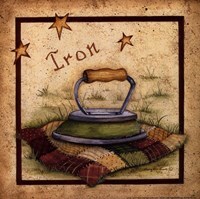 You’re however at liberty to explore the available options in order to achieve the best results.